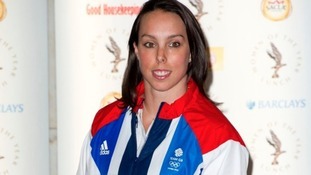 British gymnast Beth Tweddle shared pictures of her progress as she recovers from neck and back injuries. Channel 4 has asked its producers to review safety procedures after the Chester gymnast Beth Tweddle suffered a serious neck injury while filming the entertainment show The Jump. The programme features celebrities competing in a variety of winter sports, including ski jumping. The athlete has undergone surgery on fractures to her neck. Dancing on Ice stars will battle it out to be the ultimate champion in the last ever final. It promises to be a real North West affair with Blackpool's Hayley Tamaddon, Ray Quinn from Liverpool, and current champion Beth Tweddle from Cheshire taking to the ice. The three spoke to Granada Reports Showbiz correspondent, Caroline Whitmore. The bronze medallist from Cheshire was the target of sexist abuse on Twitter, urged web users to report trolls bullying..
"It's really important young people feel safe and empowered online and know how to report anything that upsets them or to tell an adult. It's also vital that parents feel confident enough to discuss online safety with their children." Today is the 11th Safer Internet Day with the theme 'Let's create a better internet together'. Following the announcement that Dancing on Ice will finish after next year's series, we look back at the past winners of the show. Olympic gymnast and Dancing on Ice Champion Beth Tweddle was back in Liverpool today to unveil a body cast of herself. The gold sculpture was made in celebration of her Olympic bronze medal and will be on display at the Liverpool Museum. It's the first time Beth has been back in the North West since winning the ITV show Dancing on Ice. Gymnast Beth Tweddle was left "speechless" after she was crowned the winner of ITV's Dancing on Ice 2013. So glad @bethtweddlenews won she was amazing and got so many bad comments at start , glad she proved judges wrong #DOI !!! @bethtweddlenews @thedanwhiston SO glad you won guys! Totally deserved! Your Bolero was amazing! !